ITMedia reported that today March 19 Tokyo Local District Court dismissed a case filed last December that Hiroyuki Nishimura, a founder of Japanese giant anonymous bulletin board service 2-channel, for not deleting posts by an already-arrested illegal drug seller on the site. Nico Nico Jikkyo (Jikkyo originally means “live state” in Japanese, but in this case, abbreviated form of Jikkyo-Chukei, “play-by-play broadcasting”) is a newly introduced service by Dwango, who runs Japan’s most popular online video service Nico Nico Douga. Nico Nico Jikkyo introduced a client application for Windows, which shows the similar layout with Nico Nico Douga, left-side video area and user comments flow over the video. The big difference is, the left box does not show anything but it is completely transparent to the background Windows desktop level. By this, users can use their own TV tuner unit on their PC to show TV programme, and scale the Nico Nico Jikkyo application to fit to the background TV image. Users realtime comments are collected on the server side and shown to other TV watchers, so users can talk on current broadcasting with many others over the internet. In Japan, ground-based TV broadcasting still dominates what people watch everyday. Although there are satellite and cable choices, such paid channels are not widely watched as same as in USA. One of the most active bulletin boards on the massive anonymous BBS 2-channel are 7 Jikkyo-Ita (live TV watchers thread) for Kanto region’s 7 channels. For example, Jikkyo-Ita for NHK, national channel, has now its No.48621 thread, which means there have been about 48,621,000 comments in their 10 years history. It is said that one hour program gets 100 to few thousands comments (depends on channel and programme popularity, of course) there. So, everyone knows that talking over the TV programme could be a great consumer generated media, and besides 2-channel Jikkyo-Ita, there have been many attempts to create those chatters community on the web. The biggest obstacle is copyright. There is not many move from TV networks side to the web integration except few challenges on Nico Nico Douga/YouTube/etc. In Japan, traditional media keeps rather hostile attitude against the net so there is no Hulu-like services existing yet. This Nico Nico Jikkyo, seems carefully to avoid the copyright infringement with TV networks, but combining two very successful web services came from the single person, the 2 channel founder and the guy behind Nico Nico Douga, Hiroyuki Nishimura (aka Hiroyuki). Hiroyuki Nishibuya, founder of Japan’s biggest anonymous BBS 2ch.net (Ni-Channel), revealed that he had transferred the ownership of 2ch.net to oversea on his blog. The FAQ on 2ch.net was modified, too. A 2ch.net is managed and operated by PACKET MONSTER INC.
2ch.net has been at the heart of libel lawsuits in decade since it established in 1999. Those lawsuits targeted at Hiroyuki as individual, and freedom of speech on 2ch.net has been somewhat kept by his attitude to emphasis those suing people getting more and more attentions from 2ch users. The tribuneship of 2ch is now handed to a company PACKET MONSTER INC., which looks in Singapore. I think this is to avoid farther suits by removing the existence of the service from Japan, i.e. Hiroyuki still owns the service via the paper company. The servers of 2ch is always explained to be run in USA from its beginning. Now it becomes much more complicated to take legal action to 2ch.net in Japan. In Japan, 2channel (2ch) is the biggest anonymous online forum, and they are very notorious for its unregulated contents. 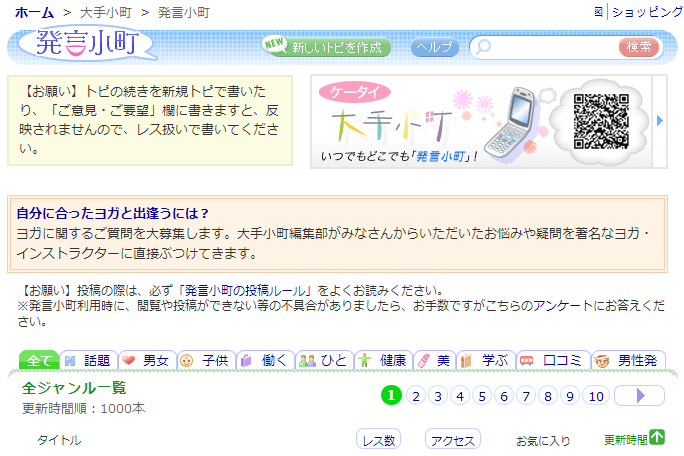 Hatsugen komachi (Komachi) is another huge anonymous online forum with 100 million page views per month. Komachi is operated by the world’s largest newspaper company Yomiuri-shimbun. Unlike 2ch, it’s moderated by operators. Still words are not very gentle. Komachi is very differently marketed from 2channel. Hatsugen komachi is a part of Oote komachi, a life-style portal site for women. Komachi successfully obtained ads from big companies. Komachi has 3000 posts per day. In most posts, people discharges her/his personal experience, problem with family, or emotion. Then other people give them a some kind of advice or blames. * My 61 years old daddy is going to travel with a woman, and he kept it secret to my mother. Should I talk it to mom, or not? * In my childhood, my mom told me that my neighbour described me as a ‘very ugly baby’. Now I’m in my 30s, but still I can’t overcome that word.